iStockThis is not how the modern career path should look. 1. Turkey could solve its banking crisis with one simple mechanism — raising interest rates by as much as 10%, encouraging investors to put more money in Turkish banks. But that looks unlikely, given that President Recep Tayyip Erdogan is exerting influence over the country’s central bank and has publicly described interest rates as “evil”. As things continue to get worse for Turkey, the West fears not only the economic repercussion but also the strategic and military consequences if Turkey falls, as it acts as a physical buffer between Europe and the war in Syria. 2. The Turkish lira is still under pressure this morning but is holding within yesterday’s range against the USD. Last week the lira fell 25% against the USD, suffering from trade tensions with the US, deteriorating current-account balances, and fears over Erdogan’s influence over the central bank. Meanwhile, the US dollar index briefly hit a 12-month high before losing ground, with most major currency pairs little-changed from yesterday’s levels. 3. Elon Musk has attempted to explain why he said via Twitter that he had “funding secured” for a deal to take Tesla private. Although the only conclusion to be drawn is that funding was, in fact, not secured. And that could spell serious trouble for the founder. Read his blog post explanation here. Meanwhile, if he does manage to pull this off and do a deal with the Saudis, the company could actually take over the world. 3. Bitcoin had a wild ride overnight, trading between $US6,100-$US6,500. 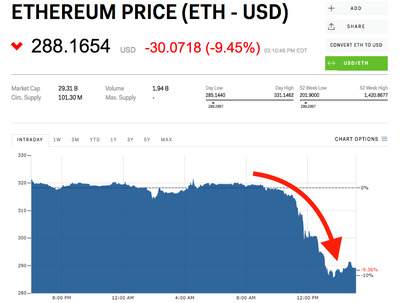 There was also a heavy selloff in ethereum — the world’s second-largest cryptocurrency — which one analyst attributed to ICO projects cashing out of their crypto capital raisings to fund operations. The price of ethereum is now down more than 61% this year. 5. NAB’s cash earnings are down for the third quarter. In a trading update, the bank says Unaudited Cash earnings for the three months to June were $1.65 billion, down 3% on the same period last year. Unaudited statutory net profit was $1.65. 6. Australian broadband users are finally doing what the NBN wants: upgrading to higher speeds. The move suggests that the broadband company’s strategy of cutting wholesale prices might be finally paying off. Signups for 50Mbps increased by 47% in the June quarter to nearly 1.5 million, a 900% increase on six months earlier when the subscribers sat at just 159,000 amid complaints about cost and slow services. More here. 7. Are you still waiting to hear back after a job interview? Well, you’re not the only one. In fact, the majority of Australian job candidates wait longer than a month to hear back about a role. And 30% have waited six weeks for a potential employer to get back to them. Fed up with the long wait times, 63% accept a second-choice job offer because their preferred employer took too long. This should be a warning to all the recruiters out there. 8. People, a career path isn’t linear. And if you think it is then it may be holding you back from success. Jumping on the career escalator, riding it to the top and getting off when you retire isn’t how the modern career path works. What to know more? Here’s what successful Australian entrepreneurs have to say about it. 9. Samsung’s latest competitor to the Apple Watch is here: the Galaxy Watch, a $US330 fitness-focused smartwatch. With Apple Watch as the best-selling smartwatch in the world, Samsung faces an uphill battle if it wants to unseat Apple as the queen of smartwatches. Here are some of the key features that sets the Galaxy Watch apart from others. 10. Everyone wants to be richer. So what type of people have more luck reaching financial success? Thomas C. Corley studied and interviewed 233 wealthy individuals over the course of four years and found three common ways they build their fortunes: the ‘saver-investor’, the ‘virtuoso’, and the ‘dreamer’. Here’s which one you want to be.